Ellis Island is famous today for being the portal to the American dream and opportunities immigrants did not have in their homeland, having admitted over 25 million people in its time. It was a symbol of life, liberty, and the pursuit of happiness, just like the Statue of Liberty. Visit Ellis Island and learn not only about the history of America but the history of your own family. The name Ellis comes from the island's owner, Samuel Ellis, who possessed the property in the 1770s. The Native Americans originally used the land to hunt oysters but since then it has evolved from a pirate hanging site to a harbor fort, an ammunition depot, and finally an immigration station. The original building burned completely, its record wholly lost, in a fire in June of 1897. The new station, a fireproof construction which now houses the museum, was opened in 1900. 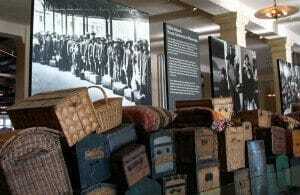 The Ellis Island Museum, in the main building of the immigration station, has been restored to look as it did in 1918. Visitors are offered the rare chance of reliving the immigration experience as their ancestors may have, going through different checkpoints, baggage holds, and more. Children's tours and in-depth tour options are available to teach visitors the history of Ellis Island with interviews, rare information, and more. Explore the stations and exhibitions holding artifacts, photos, videos, interactive displays, and an American Immigrant Wall of Honor. Look through the exhibit "Journeys: The Peopling of America - 1550s-1890" to see a timeline of the earliest arrival, Anne Moore, to the last to be processed through the island. Watch the award-winning documentary "Island of Hope, Island of Tears" and marvel at the interactive collage, "American Flag of Faces," where the stripes and stars of our flag are made up from the faces of immigrants.